Ozotic 907 is part of the Beam Collection. It’s a clear base packed with blue/purple and green/yellow duochrome glass flecks. Depending on the lightning it’s either very blue/green or more purple/yellow. I layered one (yes, that’s all it takes) coat of 907 over a black base without top coat. The formula is great. It’s very dense and the flecks spread nicely. Drying time is average. I really can’t say anything else than that I really love this! I couldn’t stop staring at it in different lightning. That is what I love with Ozotic’s. They’re pure magical. You really can’t form an opinion just based on how it looks in the bottle. You need to play with layering it over different undies… Seeing is believing! What do you think? And do you have a polish from the Beam Collection? Pssshhh: Petra is giving a 20% discount on all Color Club polishes this weekend!!! 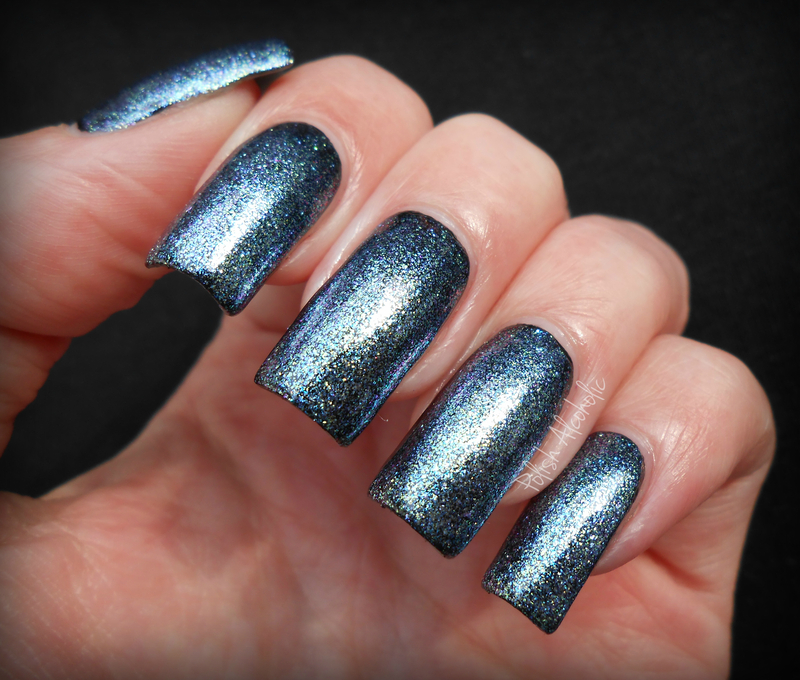 This entry was posted in Indie, Ozotic and tagged duochrome, duochrome glass fleckes, glass flecks, ozotic 907, ozotic beam, ozotic beam collection, ozotic beams, ozotic swatches by Polish Alcoholic. Bookmark the permalink. Oh this looks gorgeous, I can’t believe it’s just one coat! I don’t own many crazy cool polishes like this. It’s awesome on you! This is really pretty, but its almost too silvery for me.